Singing Therapy Helps Stroke Patients Speak Again : Shots - Health News "Singing therapy" is one treatment researchers are using to help brain trauma patients gain the ability to speak again. 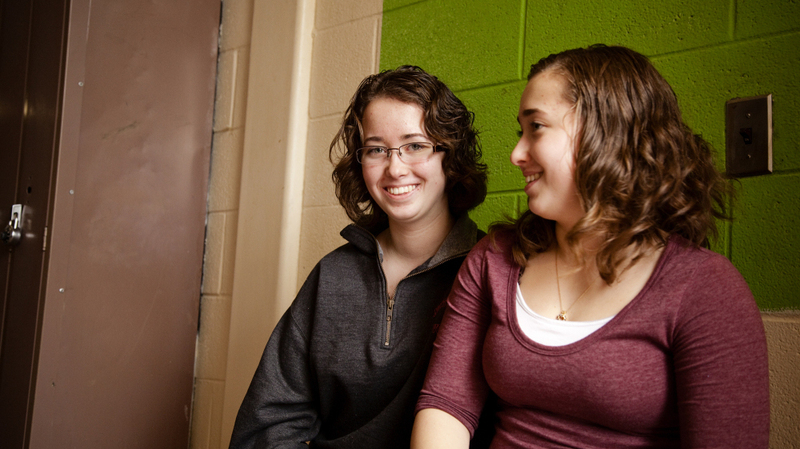 Laurel Fontaine, 16, (left) and her twin sister Heather. When Laurel was 11 years old, she suffered a stroke that destroyed 80 percent of the left side of her brain. The singing therapy helped her regain the ability to speak. But now Meyerson is learning to talk again through an approach that trains the undamaged right side of her brain to "speak." Specifically, it's a region that controls singing. For more than 100 years, it's been known that people who can't speak after injury to the speech centers on the left side of the brain can sing. In the 1970s, Boston researchers started to use a sort of "singing therapy" to help stroke survivors speak again. However, it never caught on much – perhaps because a lot of therapists, not to mention patients, weren't comfortable singing what they wanted to say. And back then, the science wasn't advanced enough to show the actual changes in the brain that result from the therapy. Congresswoman Gabrielle Giffords, who has had a version of "singing therapy," astounded everyone by her ability to speak again – albeit so far in single words and short phrases. Nearly a year ago, a would-be assassin's bullet tore through the speech center in Giffords' left brain. Less visibly, an NIH-funded study at the Beth Israel Deaconess Medical Center in Boston may be the first rigorous trial of singing therapy. They call it melodic intonation therapy. Post-stroke patients are assigned to a form of conventional speech therapy or to singing therapy. They undergo 90 minutes of treatment a day for 15 weeks. Debra Meyerson participates in a singing therapy at the Beth Israel Deaconess Medical Center in Boston, MA. Meyerson suffered a stroke 15 months ago and is now beginning to talk again. Debra Meyerson, 54, is a volunteer in that study. Her aphasia is a cruel twist of fate. Meyerson is an expert in gender and race relations who was a dynamic and popular speaker before her stroke. After a year of conventional speech therapy, she couldn't speak more than a word or two. When NPR sat in on one of her therapy sessions recently, Meyerson still struggled to speak even the simplest phrases. But she's beginning to talk again. "If you go to a restaurant and the server asks if you'd like something before your main dish, you might choose something like this," therapist Andrea Norton says, showing Meyerson a picture of a salad. Then Norton sings the word "salad," intoning the syllables on a minor third – the tune every child knows from the taunt "nyah-nyah! nyah-nyah!" I'm singing in my head and talking out loud without singing. Norton slows everything down. That's critical because the right side of Meyerson's brain – the singing part that's being retrained to "speak" – is good at melody and pitch, but it's not as fast as the left-sided language center, called Broca's area. It's also not as good at the rhythmic components of speech. That's why Norton taps Meyerson's left hand (controlled by the right brain). The tapping entrains the rhythms of speech and engages the motor nerves needed to produce speech in Meyerson's mouth and throat. Then she shifts to a different phase – bridging the gap between singing and speaking. First Norton has Meyerson sing the phrase "Would you pour me a glass, please?" Next the therapist says it with exaggerated diction that's in between singing and normal speech. Then, gratifyingly, Norton speaks the sentence. "Would you pour me a glass, please?" she says. "Nice!" Norton says. Watching this laborious process, you might not appreciate the remarkable thing that's going on inside the brains of patients like Meyerson. The Harvard team has evidence that melodic intonation therapy actually remolds the brain. One of the clearest examples is Laurel Fontaine, a 16-year-old sophomore at North Attleborough High School in southeastern Massachusetts. A little more than four years ago, when Laurel was 11, she suffered a devastating stroke – unusual in a child, but not as rare as you might think. Laurel's stroke destroyed 80 percent of the left side of her brain. One of her doctors says it's the biggest stroke he's ever seen. 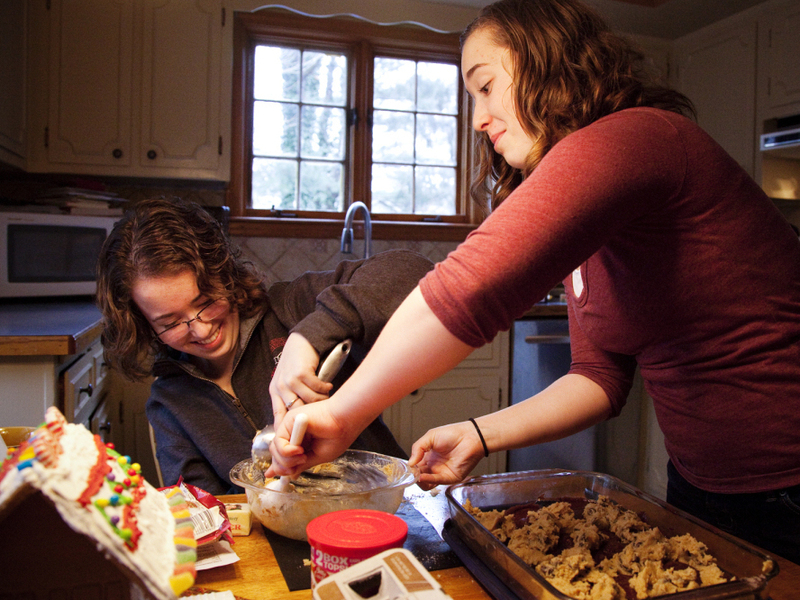 Laurel and her twin sister Heather bake together at their home in North Attleboro, Mass., on Friday, December 23, 2011. "My doctor told me I'm not going to talk, I'm not going to walk, I'm not going to, like, do anything...press buttons...ever," she says. After a year of conventional speech therapy, Laurel could speak only a word or two at a time. Then her mother persuaded the Beth Israel Deaconess researchers to let Laurel enroll in their research project. The singing therapy lasted only about four months, but it's had permanent effects. Though Laurel still struggles sometimes to find the words she wants, she doesn't have to sing them out loud. "I'm singing in my head and talking out loud without singing," she says between classes. "I do it, like, really quick." Laurel offered the researchers a big bonus – an identical twin sister named Heather. So the researchers could use MRI scans to compare the girls' brains. They focused on a structure on the right side that's important for singing. Before Laurel began melodic intonation therapy, that structure was smaller in her brain compared to Heather's. That's probably because she hadn't been doing anything with her voice for a whole year. But during therapy, scans showed that nerve fibers in Laurel's right-sided singing center actually grew – they clearly multiplied and thickened. With therapy, those nerve bundled got bigger than the corresponding region in Heather's brain. Dr. Gottfried Schlaug, who heads the study, says that's exactly what he was looking for. "It is the perfect confirmation," he says. "Basically, the hardware of the system really changed to support this increased vocal output." And Laurel continues to improve. It's possible, Schlaug says, that when Laurel is in her 20s, someone who didn't know any better would never suspect she ever had a massive stroke that left her unable to speak. But how much of her remarkable recovery is because Laurel was so young when her brain was injured? Schlaug says her youth was definitely a factor. "However, we know that patients even in their 80s can show plastic changes to their brain, can show adaptations," he says. It just may take longer. And, as with learning a foreign language at a later age, an older brain may never get to the same level. From his work with older patients Schlaug says a surprising amount of recovery is possible. He also reports good results working with autistic children and people with Parkinson's disease who have trouble speaking. Schlaug thinks singing therapy can be enhanced by simultaneously stimulating the brain with painless, low-voltage electricity – and one day, possibly, by drugs. For now, it takes an incredible amount of willpower. Meyerson can testify to that. "Recovery is long and hard," Meyerson told Laurel Fontaine recently when therapist Andrea Norton brought them together. "Well, it's hard at first," Laurel told the older woman. "But you can get used to it. I'm getting better all the time. Don't get frustrated." "Yes...yes...thank you!" Meyerson replied, clearly moved by Laurel's example. Clearly Laurel's a star and Deb Meyerson has a long way to go. But she's determined to get there. By next Labor Day — the second anniversary of her stroke — Meyerson wants to start public speaking again, this time as an advocate for better stroke care.